How yoga helps you to NOT lock your keys in the car…9 times. A few years ago, I was in the midst of a very stressful time in my life. My family moved from Seattle to Austin, my husband was traveling all the time and I was looking for a house while I was looking for a new job with two small homeschooled kids in tow. How did I know I was stressed? There were lots of clues but one that I couldn’t ignore… Over a nine-month period, I locked my keys in my car seven times. The first time it happened, I got out of the car, closed the door and then I spotted the darn keys sitting right in the middle of the driver’s seat. I did my grocery shopping while my sister came to the rescue and met me in the parking lot with my spare. The next time it happened, only a week later, I called my mom, just to spread around the love. The third time it happened, I called my sis again and tried to mask my embarrassment by talking as if we’d both completely forgotten about those other times. “Emily, you’ll never guess what just happened!” She didn’t say much when she delivered the key, but that night I was gifted a special magnetic key box wrapped in a ribbon. Thanks to the key box, my mom and sister were off the hook for the subsequent keys-in-car incidents, but I wasn’t. As the stress in my life continued and even escalated, the key-problem did, too. I got more frustrated and upset with myself each time it happened, only adding to the stress with self-loathing and unkind self-talk. No matter how much I wanted to stop it from happening and thought I should be able to, I couldn’t. The pressure was building and I was more of a nervous, stressed-out wreck until something inside of me gave way. A stress-dam burst. I’m not sure how it happened, perhaps divine intervention, but somewhere around incident #7, as I reached under the hot and grimy car for the key box, again, I finally had to just laugh at the craziness of keys-locked-in-car so many darn times. I stood there and laughed pretty hard, because really, I was laughing out all the difficulty of moving and absent husband and no friends and small kids around me all of the time. For a moment, I got this gift of seeing all that stuff from a perspective that wasn’t so doomsday. Laughing helped me to let go of some of the pressure I put on myself to do it all and to do it perfectly. I still locked keys into car a few more times because life got crazier after that day. Only after many months did I realize what I had to do for the major stressors in my life to shift. Some shifted on their own. As they did, no more keys locked in the car. Patañjali addresses this in the yoga sutras. He doesn’t specifically mention keys locked in cars, but he is does speak to this all too human experience of stress or duhkha, and its symptoms. In sutra I:31 we see that scattered thoughts, agitation, negative thinking, discomfort in the body, and short and shallow breathing are ways we can tell that our stress level is high and we are out of balance. Yep. Don’t I know it. So how do things start to shift? 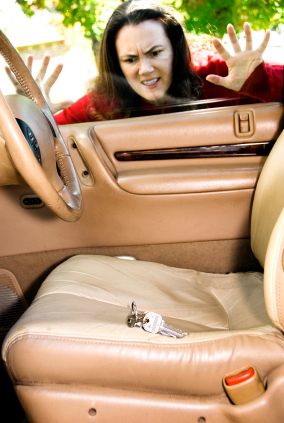 If really wanting not to lock the keys in the car doesn’t work, what will? Patanjali says that we cultivate our ability to pay attention. It all starts here. A yoga practice is designed to help us focus our attention by bringing our body, breath and mind together in one place. It makes sense that when our thoughts aren’t jumping between 20 different thoughts, we can be more present with what is going on right in front of us. We can see and perhaps understand a situation more clearly. We can know how to proceed, even if that means waiting out some of the hard stuff and laughing as much as we can along the way. It all starts with having a practice that helps our mind to be attentive and focused. The ability to focus our attention reduces distractibility and the other mental symptoms of stress. Eventually we start to see the much more desirable symptoms of attention like positive-thinking, feelings of ease in the body, peace and calm, and long smooth breathing, And when we are there, really practicing, able to focus and pay attention… we hardly ever lock our keys in the car. 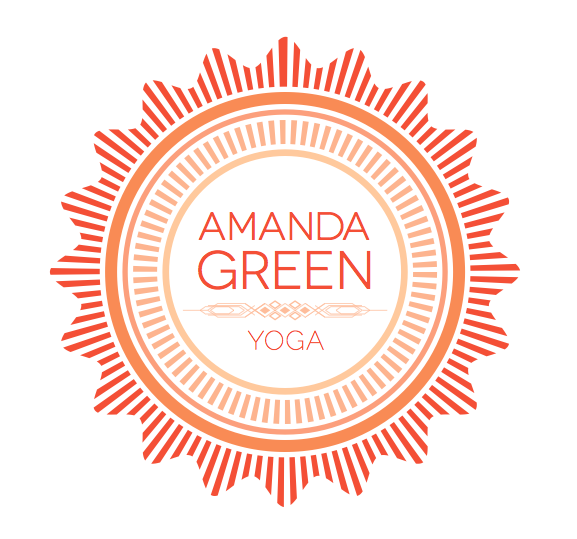 Join Amanda in Austin, TX this Saturday, May 17th for her workshop: More yoga, Less stress. We’ll talk about how stress affects our body and mind and how yoga and the wisdom of Patanjali’s yoga sutras can help us weather the challenges of life so we can better enjoy positive-thinking, feelings of ease, peace and calm, and long smooth breathing. Barton Creek Country Club 2:00-4:00 www.amandagreenyoga.com. Thanks for the inspiration, Amanda, this week, and the past weeks. As a Yoga Therapist practicing in the Midwest where people are just starting to wake up to the value of our teachings, you are helping to keep me grounded. Nail hit on the head, bravo.